Gangsterism Out : Fentanyl detected in 81% of illicit drug deaths in B.C. 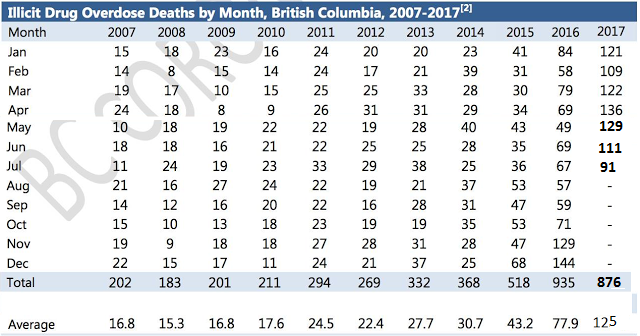 Fentanyl detected in 81% of illicit drug deaths in B.C. The B.C. Coroners Service says fentanyl has been detected in more than four out of five illicit drug overdose deaths in British Columbia so far in 2017. Out of the 876 drug overdose deaths from January to July 2017, 706 involved fentanyl. "In the majority of the deaths we're investigating, we're seeing fentanyl detected with other drugs. This presents huge challenges for those using illicit drugs and the risk is high," said Chief Coroner Lisa Lapointe. Cocaine remains the highest risk drug.